Aren't you tired of the matryoshkas and other trinkets of Arbat souvenir shopping? They may look nice at first glance, but they're hardly the most exciting momento of your time in Russia. Besides, most are rather unpractical - except maybe the sheepskin coats that can come in handy at minus 30 degrees centigrade. So let me introduce a new approach which perfectly combines sightseeing with reasonably-priced souvenir shopping. Tula is 200 kilometers from Mos­cow, along one of the best highways in Russia. Well, at least the M2 is wide and straight, so modern cars can make the journey in as little as 2 hours. It's absolutely worth the journey, as Tula is somehow a model Russian and ex-Soviet town, featuring things you simply cannot see in Moscow. According to the history books, Tula was founded at the beginning of the 12th century; the town was first mentioned in 1146. Tula's location was precarious, due to permanent raids by the Tartars. While some raids did not cause serious damage to the town, others were real disasters, leaving every house burnt down and most people killed or destitute. Tula was built to withstand the permanent Tartar threat. For the first three centuries it belonged to the Ryazan county, and since the early 16th century the town has been integral part of the Moscow power. In 1520, the walls and towers of the kremlin were completed; these are the walls and towers one can see today. The kremlin still forms the core structure of Tula; its gates are starting points for the main streets. Another peculiarity of the Tula kremlin is its size, enormously large for a town of its kind. This is probably because in Tula there was more to save than the churches and military troops themselves: During the 15th and 16th centuries, Tula's gun- and iron-making industry was founded. Iron ore, in its simplest form, can be found almost everywhere in Russia - just like in most of Europe. Tula is no exception - and, given that living on a frontier requires weapons, gun-making crafts have flourished here since the 15th century. The people of Tula initially made simple, low-cost iron goods and reliable knives and guns. From the end of the 16th century, the quality of forgery and gun-making in Tula increased dramatically thanks to master-classes by leading European gun-making experts. By the middle of the 17th century, Tula was already the leading gun-making town in Russia, where nearly every state gun order was fulfilled. Tula enjoyed all the conditions to become Russia's first industrial town. And the town really became the leading industrial center during the 18th century. The state-owned Tula gun-making plant was founded in 1712 on orders of Peter the Great. The plant was, from the very beginning, equipped to meet the latest European standards, so Tula guns were strong competitors to Western brands. According to the records, 22,000 guns were produced in the year 1720 - a high output at the time. Later, at the end of the 18th century, Tula craftsmen began to produce the decorated guns which became Tula's signature product. They were manufactured to order and on demand. The level of decoration was comparable to the best European brands of the time. Decorated guns can be bought even now - there is a special shop near the plant in Tula. One can easily go to see the plant and visit the shop - both are located in the very centre of town, between the kremlin and the river Upa. From the kremlin's entrance, the best way to get to the Tula gun-making plant is via Metallistov Street. 300 years ago, this street consisted of one-story wooden houses which belonged to iron-makers. However, from the mid-18th century the street was among the most glamorous in Tula. Here stood the houses of the governors and the richest noblemen and merchants, including one of the Demidov family. Demidov's name is somehow a symbol of Tula industry: initially a skilful craftsman, he managed to get acquainted with Peter I and created the business plan for Tula's gun-making industry. He instantly became the most powerful man in Tula, turning that power into the town's prosperity. Certainly by today's standards, Demidov's business was quite ugly (thousands of workers died of overwork and poor conditions), but for that époque such conditions were commonplace. Later, when Demidov and other Tula tycoons founded plants in the Urals, Tula became the town where innovations were tested and the best items were made. Walk along Metallistov street and see how picturesque and modest these manors used to be and how poorly they are maintained now. Luckily, the town authorities promise that all the houses along the street will be restored and returned to glamorous residential and commercial houses. Walking across Tula can be extremely informative. Some older streets (like the aforementioned Metallistov) have preserved their old buildings, while others reflect the different stages and styles of the Soviet architectural school. The town's park can show you what a model Soviet `culture park' was like: shadowy alleys, simple attractions for children and cafes with barbecue menus. All this surrounded by the ubiquitous solid fences. The walk around town can take 3 hours or even more. When you're turning back to head home, don't forget to buy some more souvenirs: Tula's gingerbreads and candies are not available in such variety in Moscow; and the Samovars (authentic Russian tea urns) are also a signature Tula product. 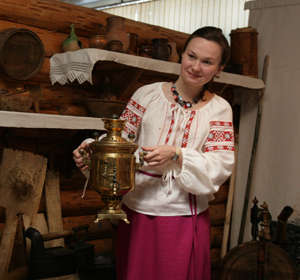 Samovars can be bought new at a couple of shops well-known to the locals (there is one at the entrance to the town).